It’s about Hercule di Barbochos Reiau de Prouvenco. With the breed club, he was almost in the same position as Ulysse is and has been, meaning banned. 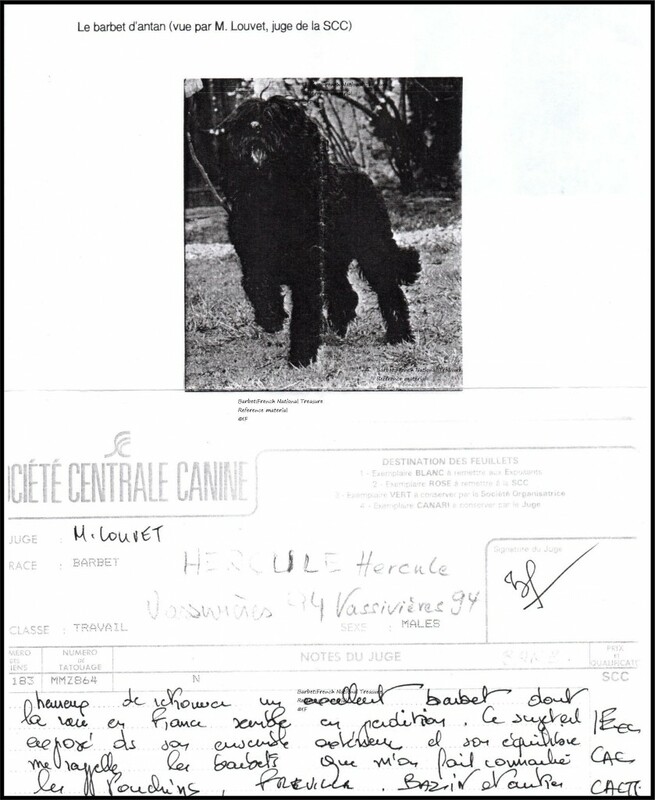 Hercule was a working dog. Had BCE and had done German tests. When some indelicate breeders claim indelicately that some of their dogs are international working champions, there are none especially not in the Barbet since they are not allowed in any field trials. This is a good example and shows another level of…incompetence and lack of knowledge of a breed. Sadly so. Heureux de retrouver un excellent barbet dont la race en France semble en perdition. que m’ont fait connaitre les Pouchins, Fréville, Bazin et autres. Happy to see an excellent barbet again of a breed in great distress. The above judges were basically all banned from judging any Barbets as the breed was replaced by a genepoodle of oodles. 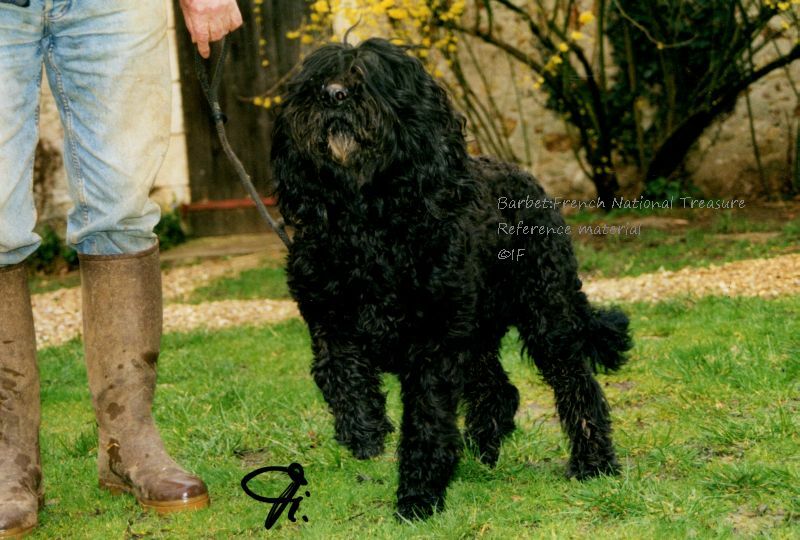 Since 1994 to this date even moreso, the breed club is responsible for the decline of what was never promoted as a hunter and sold as a matted poofed tight curled ballerina-toed oodle, that has not any type of identity and can be confused/ mistaken for a Labradoodle, Spanish Water Dog or Poodle. Commonly now called a portuguse Poodle ( for the new colors on tall shaved dogs). Sad fate for a dog caused by lack of any competence of the authorities who are supposed to “manage” it. The one on the left is according to standard. The standard was modified several times so it would correspond to the Poodle type on the right. The dog on the left still exists, but it is near extinction. The one on the right is rather rare, but as one says, needs to be vulgarisé, understrand make more and sell more. Nothing to do with selection but sales. Have you seen ever the one on the right as a working gundog or “chien de chasse”? More coming which you are going to really enjoy!